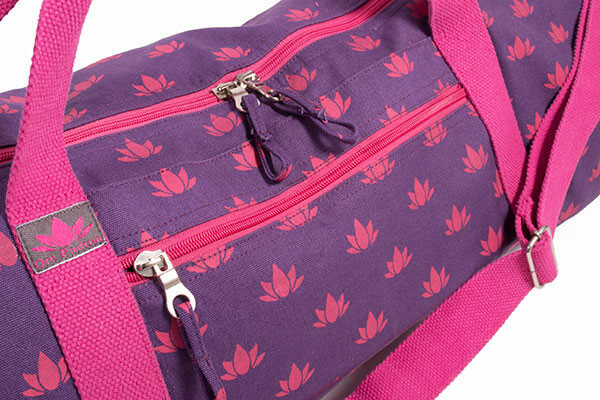 The Free Spirit bag is perfect for a couple of yoga mats, some props, or a change of clothes and your toiletries, more of a Yoga Hold-All than a Yoga Mat Bag. Made of strong cotton canvas with a contrast cotton lining and adustable webbing strap. 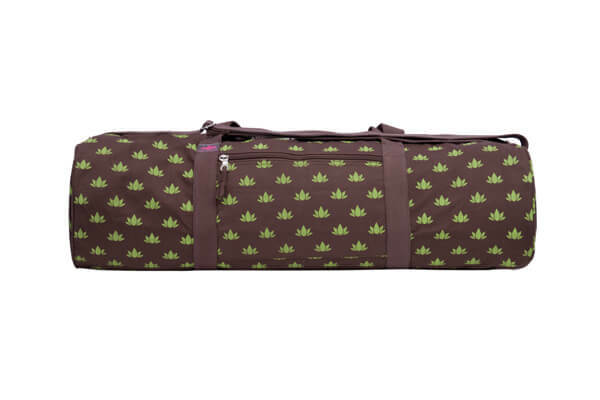 Perfect for yoga on the move. 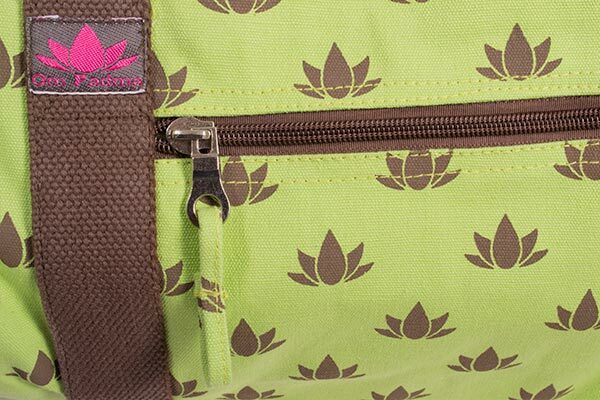 Available here in four stunning colour combinations of the signature Om Padma, Lotus Flower print fabric. Strong and sturdy large bag, takes everything I need. Just the job! I had difficulty finding a bag for my large yoga mat (80cm wide and 1cm thick) but this bag was perfect, plenty of room and easy to carry. 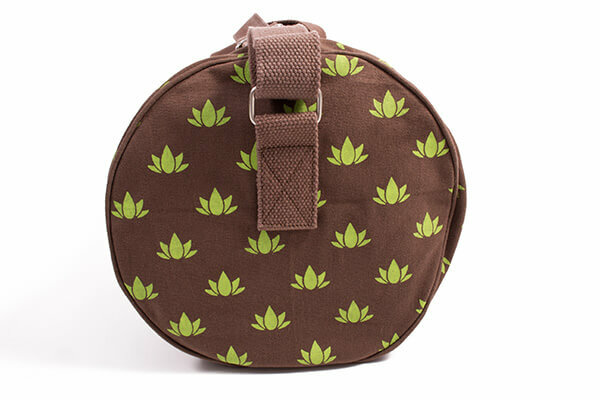 This is a fab bag , big enough to fit a mat blanket , block , strap etc . Lovely quality , well made and finished . I would definitely recommend! This is by far the best kit bag I have purchased. I have had a few during my 15years of teaching and most have either had a zip or handles broken at some point. It is extremely hard wearing and The design and colours are also very pretty. 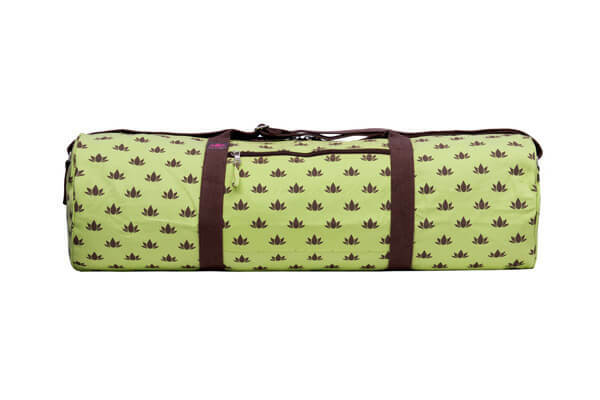 It is large enough for a mat, 2 bricks, 2 blocks and a blanket and belt. 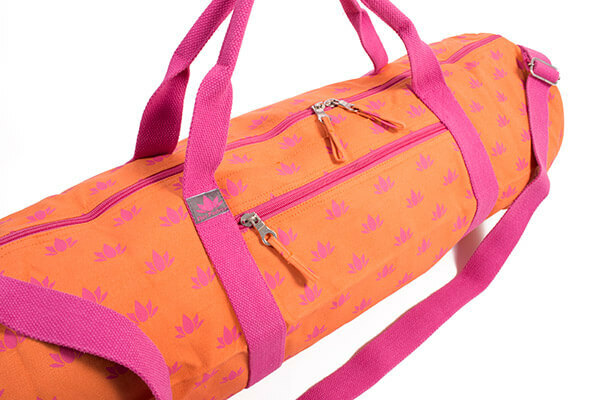 Would definitely recommend this bag. My order arrived very quickly and the bag is really nice. Well made and useful. It has pockets inside and out that I can use for personal stuff. 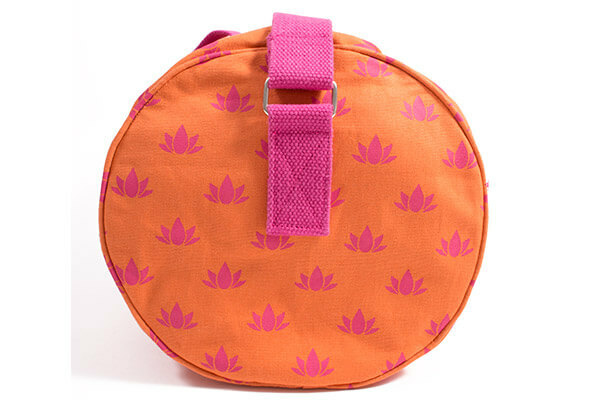 So rather than taking my handbag along with me to yoga I can fit all I need in this attractive and useful bag. 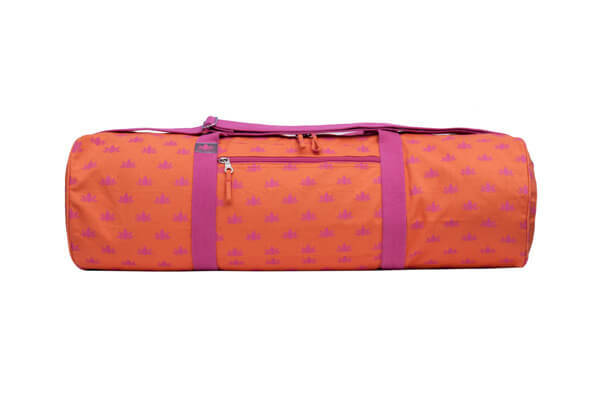 IO bought this hold all for my wife, to hold all of her extensive yoga kit - she loves it, its very spacious and very well made in deed. Received very promptly, nice bag and holds all my equipment. Would buy other products. Fabulous colour & super quality. 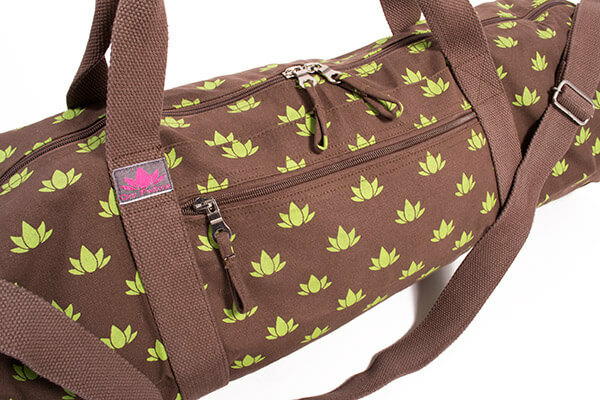 This bag has plenty of space for yoga mats plus accessories. Love the quality, colourful design and the size. 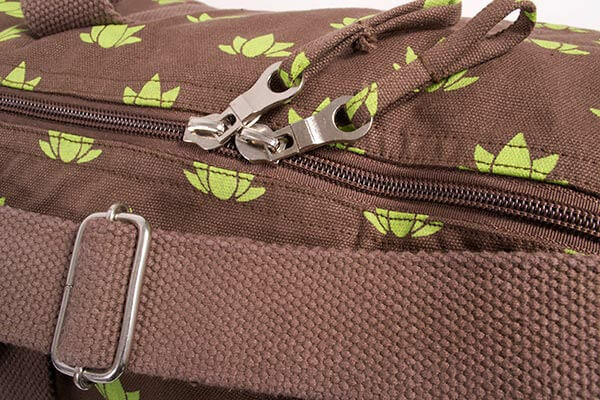 The zip pocket on the side is a useful feature. Purchased specifically to carry my old extra wide mat and my new thicker mat - it does the job with room for extras. 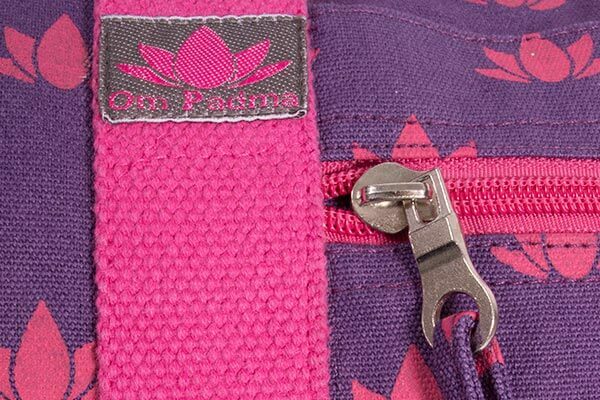 The zipped pockets are really useful & are a decent size. Excellent quality & gorgeous (I have the purple/pink colour). Bought for my partner. She says "it's brilliant". A present for my daughter, she was very pleased. Very pleased with this bag. It carries everything with lots of space. Very good price and a lovely colour-purple and pink. Excellent quick delivery too. 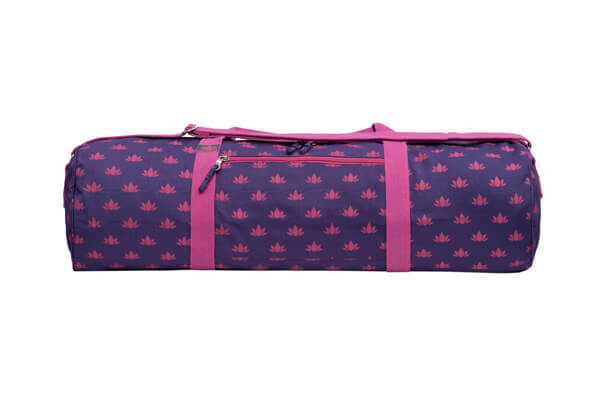 This is the first yoga bag I've had that takes everything - mat, blanket, pillow, strap etc- so it sits on the shelf looking good and ready for the next yoga session, my favourite time of the week. Bliss indeed. This was bought for me, for my birthday. It is just what I needed. A good size bag for everything, mat, block, strap and even a change of clothes if I wish. Great for on the move. Very strong cotton fabric with sturdy handles and cross strap. Lovely colours, I got the pink and purple. Would highly recommend.